Swimmer’s ear is an ear infection. The infection is in the outer ear or ear canal. It can occur suddenly. Because the canal is dark and warm, it can easily get infected with bacteria and fungus. It is common in children and young adults. This infection is not the same as an inner ear infection. That type of infection is deeper inside the ear. The medical name for swimmer’s ear is otitis externa. Pain and/or itching in the affected ear. The pain gets worse when you chew or move your ear. In serious cases, swimmer’s ear can spread to other areas of the ear. This includes the skull bone. The infection can become severe in older people and people who have diabetes. Swimming and showering too much. Water can get into your ears. Water removes earwax. Wax protects your ears from germs and fungus. Cleaning your ears. This can remove the earwax. Injuring the skin in the ear canal. This can happen by putting your finger or an object (such as a cotton swab or a pencil) in your ear. Skin conditions (eczema or psoriasis)in other parts of the body can occur in the ear canal. This can cause an infection. Bacteria from products used in your hair (hairspray or hair dye). These products can get trapped in the ear canal. Your doctor will look inside your ears. The infected ear will appear red and swollen. It also may look scaly. 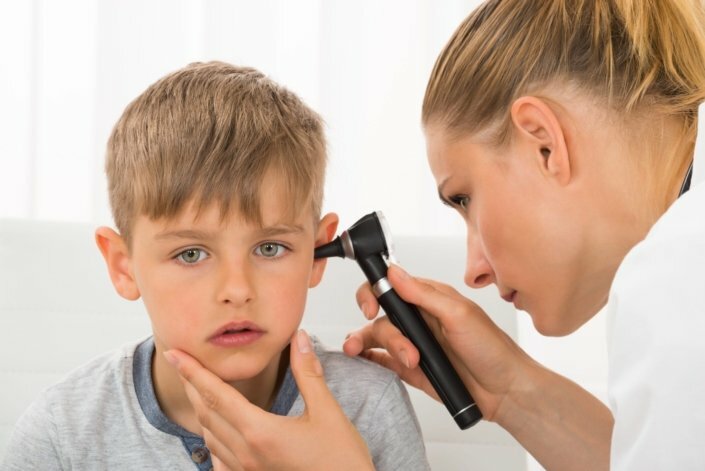 Your doctor will check your eardrum for infection or a hole. He or she may not be able to see the eardrum due to swelling. As your doctor checks your ear, touching or moving it may hurt. Your doctor may take a sample of fluid from the ear to send to a lab. The lab is checking for bacteria or fungus. Can swimmer’s ear be prevented or avoided? Never put anything in the ear canal. This includes cotton swabs, your finger, liquids, sprays, etc. If your ears itch a lot, see your doctor. Don’t remove earwax on your own. If you think your earwax affects your hearing, see your doctor. Keep your ears dry. Use a towel to dry your ears after swimming or showering. Let the water run out of your ears. Turn your head to each side and pull the earlobe in different directions. You can use a hair dryer set on the low heat to dry your ears. Hold the dryer several inches from your ear. When swimming, wear a bathing cap or wet suit hood. Special earplugs can keep water out of your ears. Mix one drop of rubbing alcohol with one drop of white vinegar. Place drops of the mixture into the ears after they get wet. This helps prevent bacterial growth. Your doctor will clean the drainage or pus from your ear. Swimmer’s ear is treated antibiotic ear drops. Over-the-counter pain medicine can relieve pain. After your diagnosis, keep your ear as dry as possible for 7 to 10 days. Take baths instead of showers. Put a cotton ball in your ears to keep the water out. And don’t swim for 7 to 10 days. Your symptoms will be better in 3 days. The should go away in 10 days. Swimmer’s ear can be short- or long-term (chronic). The most painful period is the first few days before starting antibiotic drops. Can you get swimmer’s ear from chlorinated pool water? Are you more likely to get swimmer’s ear if you have small eustachian tubes? Should my baby wear ear plugs in the bath and in pools? Can repeated infections cause serious hearing loss?